Before you explore too deeply, note that there are several important caveats about the data we have posted, the most important of which is that they are preliminary, and subject to revision. First, there are a few submitted checklists that are still not in our database. This is because they either came in very recently or because there are lingering issues that we still need to follow up on. We’re hoping to resolve these last issues very soon. Second, for several reasons, there might be errors in the lists. 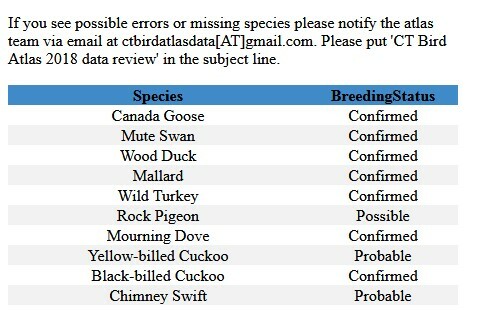 Errors could arise because a species was misidentified, because a checklist marker was put in the wrong place (causing birds to be listed in the wrong block), or because data were simply entered incorrectly. As part of our data checking process, we are asking that everyone review the checklists for the block(s) that they are the lead observer for, and for any other blocks that they know well. If you see anything that looks wrong, please let us know as soon as possible. Another source of error could be simply that data were never submitted to the atlas. 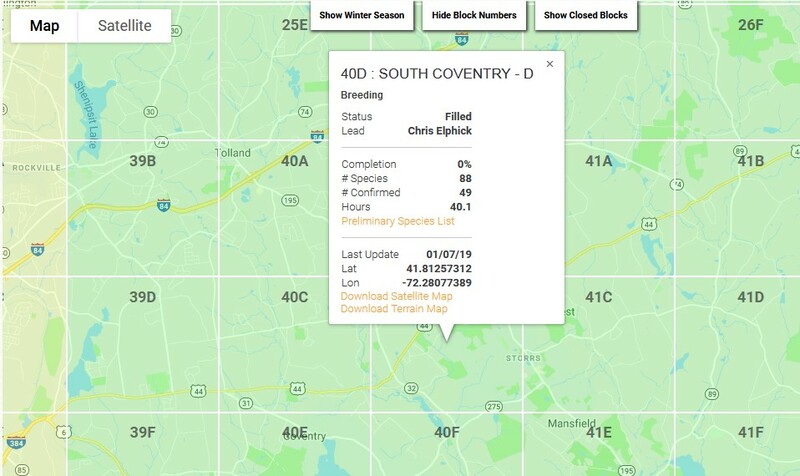 If you see species missing from a block’s list that you know were present last summer, during the breeding safe dates and in suitable nesting habitat, then please submit a checklist (either via eBird or field card). Please include a breeding code – if you just saw or heard the species then code H or S would be suitable. As you do your review, please also bear in mind that the posted lists include only those species for which a breeding code was submitted, and for which the report was within breeding safe dates. No one should consider these lists final as we have several rounds of data checking still to complete. We are posting these preliminary lists now, however, because one of our best options for reviewing the data is to crowdsource the problem to those of you that know the sites best. As the review process unfolds we will update lists so that everyone can start the 2019 breeding season with a good sense of which species have already been found in each block. Next PostNext How rare are inland long-tailed ducks?